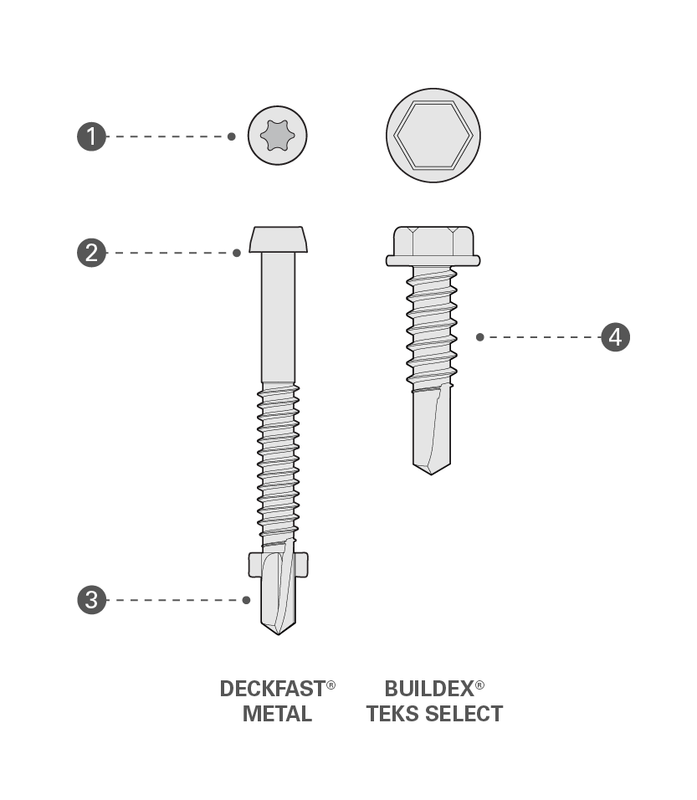 DECKFAST® Metal | Starborn Industries, Inc.
Deckfast® Metal screws are designed to attach composite, PVC and hardwood decking to steel and aluminum, including Trex Elevations® steel deck framing. It is the first line of deck screws designed specifically for this application. 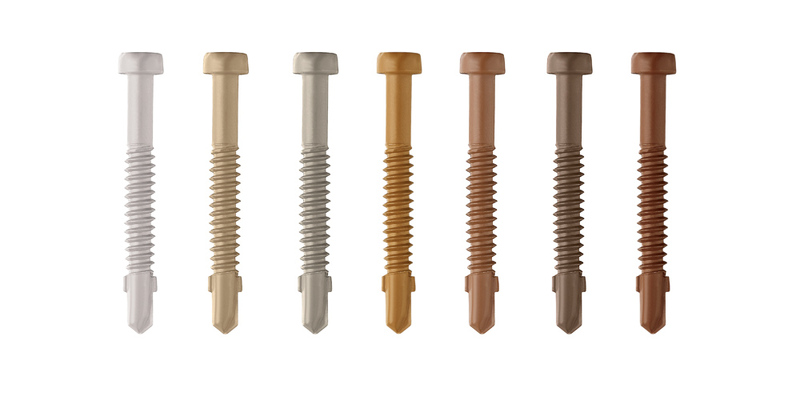 Deckfast Metal screws are made of Grade 410 stainless steel and feature extra deep star drive recesses, undercut heads, drill points, and a color matched epoxy-based polymer resin coating over zinc plate. Deckfast Metal is now available in a larger size for two-inch decking: 12 x 2-3/8". The original 1-5/8” long Deckfast Metal screw is the leading fastener for attaching one-inch decking materials to metal framing systems. 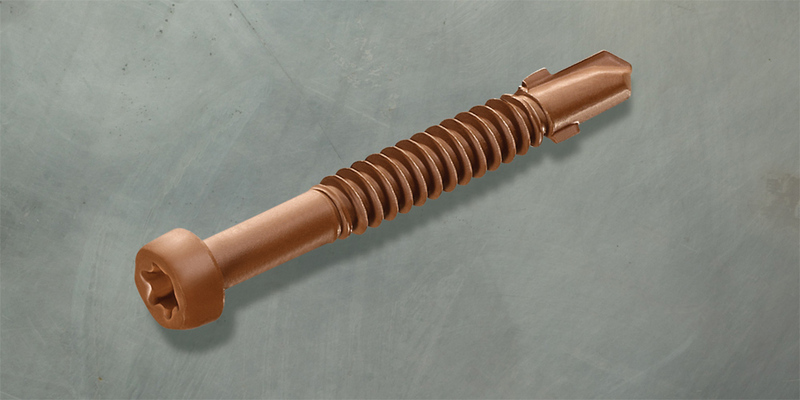 The new 2-3/8” Deckfast Metal screw is the only product on the market designed for use with two-inch decking materials in this type of application. Both versions are Trex® approved. Starborn also distributes Buildex® Teks Select™ 10-16 x 3/4” fasteners, approved for use as framing screws with Trex Elevations. Teks Select fasteners are dual hardened, and have a Climaseal ACR™ finish. Teks Select fasteners can be used for all Elevations steel-to-steel and bracket connections, as directed in the Elevations Installation Guide. 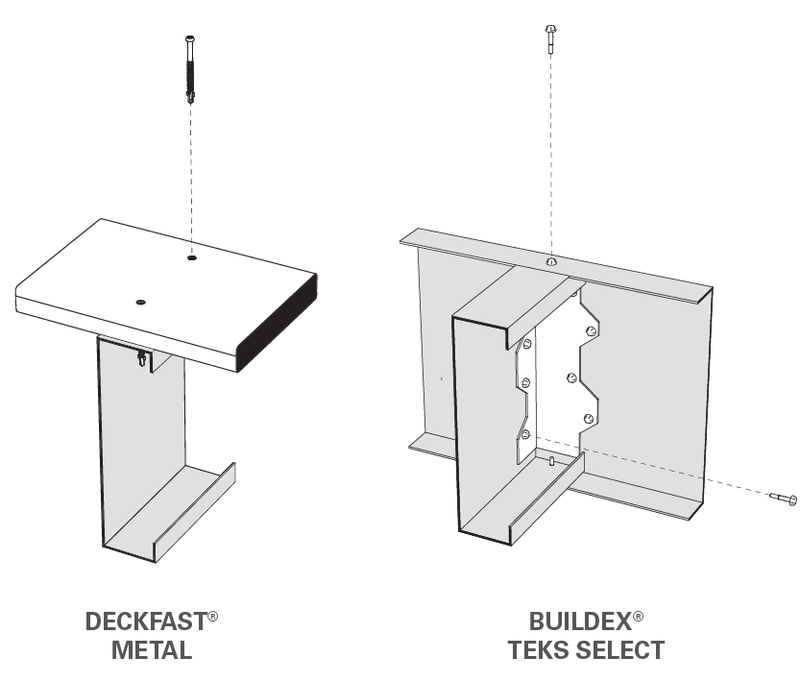 Deckfast® Metal can be used to attach a wide variety of decking materials to steel and aluminum framing, including Trex Elevations. Material: 410 Stainless Steel with Epoxy-based Polymer Resin over Zinc Plate. Cleanly penetrates the hard outer layer of capstock and hardwood decking. Drill point with wings, which increase the speed and effectivness of the drill point and also prevent mushrooms and other decking surface defects. *Note: the 12 x 2-3/8" version does not have wings. 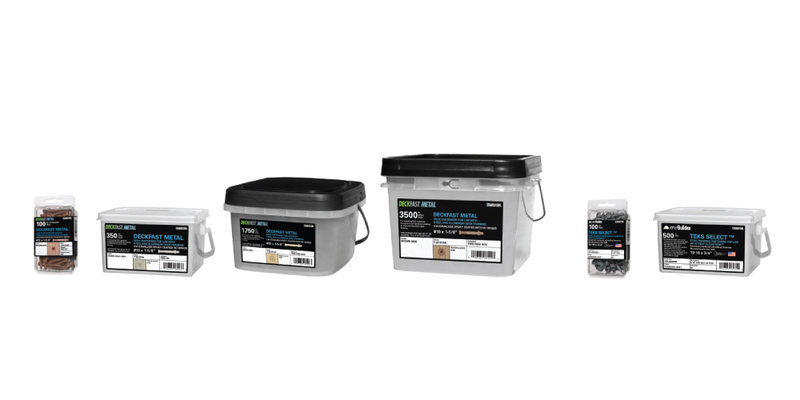 10-16 x 3/4” dual hardened fasteners with Climaseal ACR™ finish, approved for use as framing screws with Trex Elevations. Teks Select fasteners can be used for all Elevations steel-to-steel and bracket connections, as directed in the Elevations Installation Guide. Decking and Metal Dimensions: The 10 x 1-5/8” version of Deckfast Metal is designed for decking materials with an actual thickness of ¾” to 1” attached to steel or aluminum* up to 12 gauge or two 14 gauge joists doubled up. The 12 x 2-3/8” version of Deckfast Metal is designed for decking materials with an actual thickness above 1” and up to 1-1/2” attached to steel or aluminum up to ¼” thick. 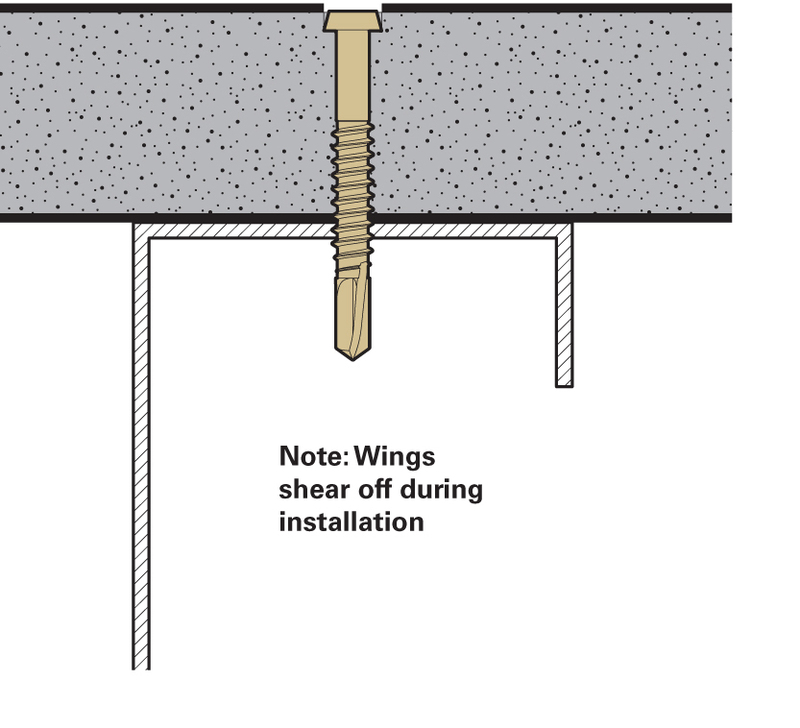 *Note: When using the 1-5/8" screw with thinner gauges of aluminum, ensure that the wings shear off cleanly by applying slightly more pressure during installation. Pre-drilling: Pre-drilling is not required, even in hardwoods. Corrosion Information: The combination of 410 Stainless Steel and an Epoxy Coating provides good corrosion resistance; however, Deckfast Metal is not recommended for use in applications exposed to salt air, near large bodies of water, swimming pools or other areas where corrosion is likely to occur. For these applications, use Grade 316 Stainless Steel fasteners. For more detailed information, see the corrosion information page. Mechanical Strength and Performance: For test data, see "Deckfast Metal Specification Sheet" pdf under DOWNLOADS section above.